Keep Your Eyes on Flaxy…That is what I was telling myself while this little episode was unfolding. It’s Spring and Flaxy has had the winter off. He’s a five year old with limited experience and his previous schooling had consisted of a few days in the round pen and one Fall season of cow works. He lacks a lot of convincing before he’ll be considered a cow pony because horses in this outfit are number two on the priority list; cows come first and men are several steps behind the horses. There are lots of good men looking for work so you had better get the job done, take care of your horse first and then figure out how to survive because somebody will be glad to take your place. I have Flaxy saddled but he’s watching my every move. I didn’t hobble him; giving him a little credit to start out. I thought it might help keep him loosened up some. I had a brand new saddle, one of those special bronc saddles, just like the professional bronc riders use, except it was modified some to look more like a using saddle. The boss had told me that I wouldn’t like this new saddle; he didn’t say why. I just figured it was because it wasn’t like his. I was pretty sure my new bronc saddle was all I lacked to being the best hand on this outfit. The sun was just beginning to show, It was a beautiful, golden mountain morning as I swung aboard Flaxy like a hobo grabbing a moving freight train. I felt like the King of Texas! The crew headed to a pasture called Devil’s Dance Hall and it was befitting of the title. Plenty of rough country and lots of getaways for these trotty little darlings to give us a long days work. Flaxy was feeling good and plenty loose as we were skipping across the rocks going along the top of a ridge turning cattle into the canyon and then up another canyon towards the hold up. We still had a long ways to go. We were in a good high trot, dodging all the bad places and the lechuguilla clumps, when the cattle made their move towards the vamoose trail. I was a little too high up the ridge and a little behind and the cattle knew it so they stepped on the gas and I did the same. I turned Flaxy down the hillside and asked him for some more speed, which he gave to me and in no time we were just short of flying! 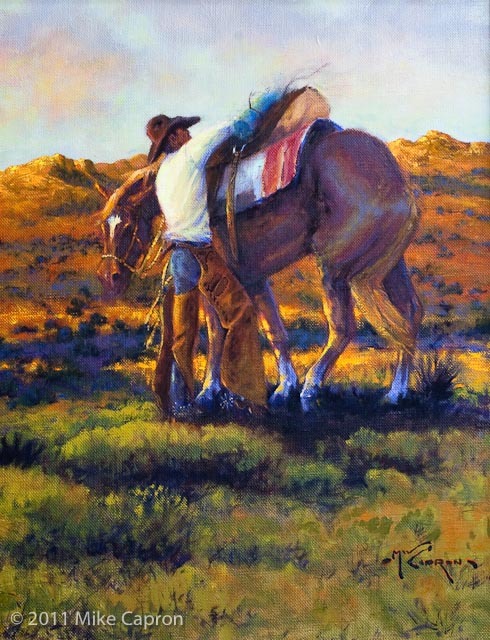 I could feel my brand new saddle sliding forward but I didn’t think that it would make any difference in our situation because I had heard that those good bronc riders like their saddles to be a little forward of the normal riding position. Needless to say, Ol’ Flaxy was not comfortable with this new saddle position at all and it caused him to start using his front end as a brake for the saddle. This was too much for my little fresh, green, Texas pony. He made two big jumps and I was air borne. I looked like a pilot ejected from a shot down jet- seat and all. Yep!…I landed about two lengths ahead of my mount, still sitting in my saddle with both feet in the stirrups, sliding over the terrain and going as fast as I had ever gone downhill. Those Olympic Bobsledders didn’t have anything on me. All the time I was sliding, I was trying to figure out how me and my new saddle got separated from our horse. I was really scratching my head when the boss rode up and without so much as a smile he said, “I told you that you wouldn’t like that new saddle,” and turned and rode off to catch Flaxy. I wasn’t too pleased with my new saddle but I still wasn’t sure why until my boss got back with my horse and told me that 3/4 plate riggings were not suited to grass fat Texas ponies because they didn’t have enough front end to hold the saddle in proper position. We didn’t have the time to stop and adjust our saddles every time we went up and down a hill. He said this little adjustment had already cost us another day of work gathering because we would have to come back tomorrow to gather the ones that I failed to turn while I was displaying my flying abilities. I didn’t lose my job, I didn’t ever ride a 3/4 plate rigging in Texas again and if the boss said anything, I was all ears! Comments for "Keep Your Eyes on Flaxy"
Linda Kirkpatrick on January 18, 2011 Mike, I love these stories! Carol Williamson on January 18, 2011 Wow I can just see you heading down hill fast on your super sonic saddle ~ Love your stories !!! Margaret Renfro on January 18, 2011 This was a great story, I really enjoyed it. Thanks to Bob Tate for sending it to me. Westley White on January 19, 2011 Glad I found you Mike. That was good and looking forward to more. 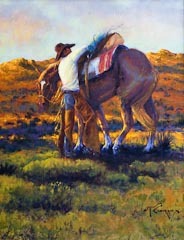 Gayle McKee on January 22, 2011 Great story..bet you rode that saddle about as well as Wally coming off the hill at Nickle Creek on David Ligon’s dirt bike. Looking forward to the next story. Sonny Chancey on January 28, 2011 A good one! Way to go Mike.